After flying into London (sleepless flight…seriously, who doesn’t try to get their toddler to be quiet at 3 am EST on a transatlatic flight? 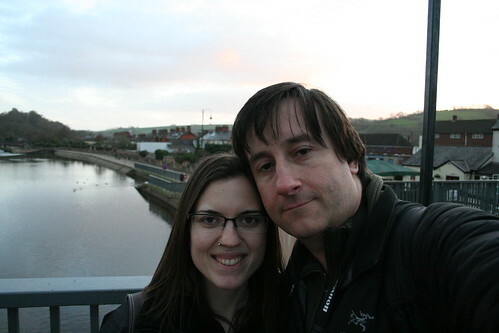 ), we rushed to catch a train south to Tiverton, our layover for the day/night before the ATP Festival. 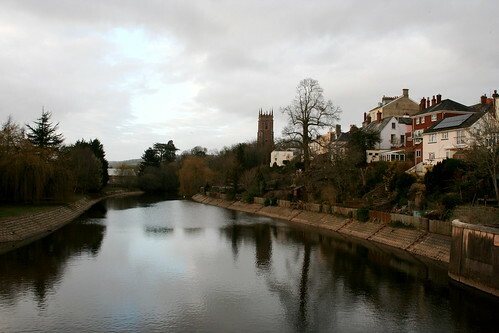 Tiverton is a quiet little town in Devon (one of the main attractions for me would be the next morning’s bus ride through Exmoor when I’d silently recite bits of Ted Hughes‘ poems in my mind–the fog, the fog, the sheep!) 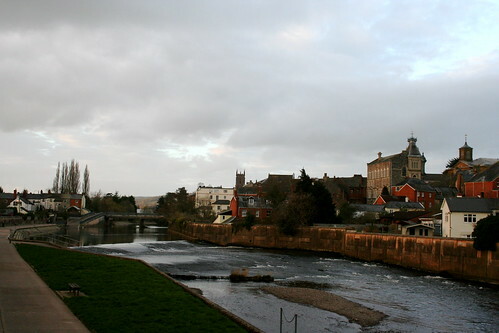 and we didn’t see much while we were there, but just walking along the River Exe and watching people go about their day was exactly what I needed to unwind after a really long night & day of travel. 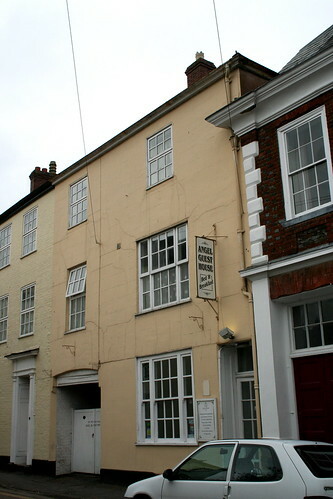 One of the best parts of Tiverton, for both of us, was the B&B we stayed at–the Angel Guest House. I’m a bit neurotic in terms of where I’m willing to stay when it comes to travel. I don’t need to stay at a super posh hotel or anything, but I need it to be clean, I need it to be quiet, and, most of all, I really need it to have a decent pillow (if not bed). 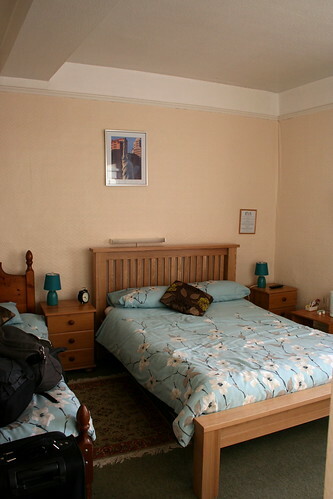 While I knew that Europe & England aren’t famed for great beds, I figured I could at least swing for clean & quiet (though I doubt there’s anywhere “loud” in Tiverton…), and the Angel Guest House immediately caught my eye. I mean, it has 4 stars on Expedia. That’s almost unheard of for under $100 USD per night! And the Expedia reviews were spot on–not only was the little B&B super clean and comfy, the owners were incredibly nice and their breakfast (which is included) was out of this world. For starters, can we talk about toast stands? I need one. Desperately. I’d probably never use it, true, but the thought of having a slotted metal thing to hold perfect little triangles of toast in is phenomenal. Love them. 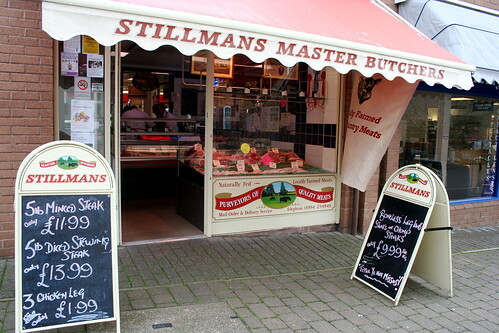 Second, how about local butchers? It seemed like they were everywhere in both England and France! The one pictured above is responsible for our breakfast sausage & ham and it took everything within me not to walk in and try to take tons of pictures like a crazy woman. It was too darn cute. And useful. And exactly the kind of place I wish I could shop at. 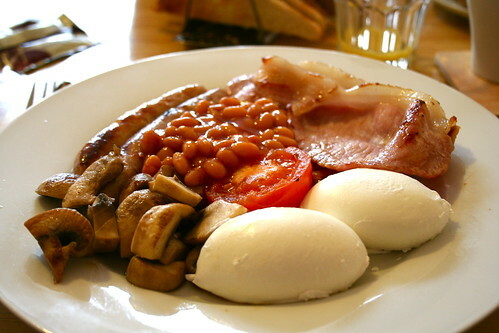 And, the finale, my first full English breakfast. Silly me, I didn’t take the photo after I sliced open one of my perfectly poached local farm eggs (the yolk, the yolk! !–forsythia yellow, I kid you not), but the breakfast consisted of toast, two eggs cooked your way (I couldn’t resist it when “poached” was offered by the owner), a roasted tomato, breakfast sausage, cured ham, beans, and mushrooms. Yes, it is a big breakfast, but, yes, it is probably my favorite other-culture breakfast to date. I’m a sucker for farm eggs and I’m a total pushover for locally raised & butchered meats. The sausage was light and flavorful without too much seasoning–the true “pig” of it came through–and the cured ham wasn’t salty at all, just cured and cooked, a perfect forkful with some beans and egg. The owners seemed truly passionate about local farms and sustainability and their B&B was cozy and clean & the food was much better than I dreamed. Definitely recommend it to anyone traveling in Devon. 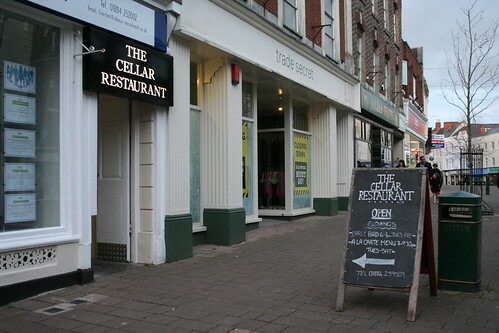 One of the weirder elements of Tiverton, however, was our dinner at The Cellar. 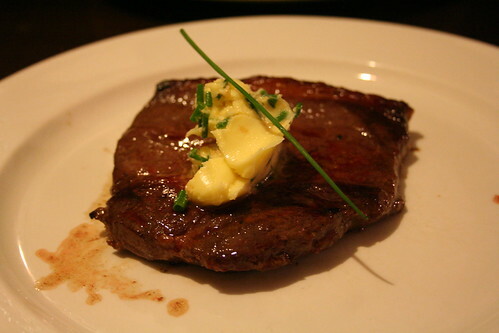 I hate to cry foul on reviewers, I mean 26 out of 33 reviews claim excellence, and maybe we just had a bad night (hilariously enough, the only other party that was in the restaurant that night reviewed their experience and they thought it was really awful), but the meal was bewildering & tasteless. As in the food had not flavor. How is that even possible? I’m not sure how to sum it up, but we were led, along with that party of 6 from the review, to a back room and asked to sit on a couch while early aughts pop music played on a boom box in the corner. Our orders were taken while sitting on said couch, even though the restaurant was empty and all the tables were set, and we were forced to wait in the weird close quarters with the weirder music (the vibe of the place is very old world England–it’s actually a nice restaurant style wise) until our first course was served (we both ordered the early special which was 2 courses for 16£ 3 courses for $18£–not a bad deal!). As far as the food goes…well, we were told they specialized in local produce and meats, which might be the case for the meats, but the entire dinner was just off. Nothing tasted like much of anything, the fish was full of bones, and the pork was overcooked. 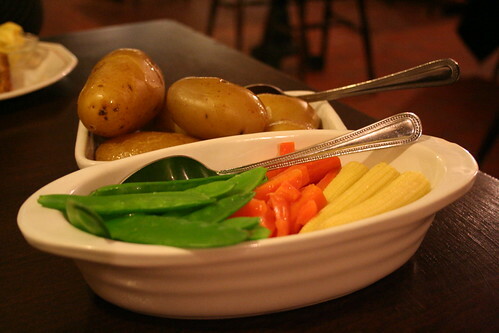 And the potatoes and vegetables served on the side? Baby carrots? Snap peas? Carrots? I don’t get it. We were in the middle of beautiful farm country with local produce in every store and they served microwave steamed “Asian-style” vegetables. Eugh. But the place has crazy good reviews after our visit, so hopefully things have improved Needless to say, it was a weird introduction to British cuisine and culture (and not a fair representation, I hope). Our time in Tiverton was short, though, and in the morning and after our fabulous breakfast, we boarded a bus to drive us across Exmoor to Minehead for the festival. The morning was foggy & damp and I wasn’t able to get any pictures out the side of the bus, but even without them, I found the trip magical. Riding through Exmoor was a realization of one of my dreams and I hope to go back soon–the bald, sheep riddled hills were cut by dark conifer forests, pheasants roamed **everywhere** (they’re like squirrels down there it seemed like), farmhouses and towns dot the landscape. It was all I could do not to jump out and just roam around for a few days. I wanted to cozy up in a tea shop and chat with some local people, get out and walk the forests and moor. But, Minehead. I was hoping to have some pictures from the festival to post, but G & I shared his smaller camera and I have no idea what memory card anything is on. 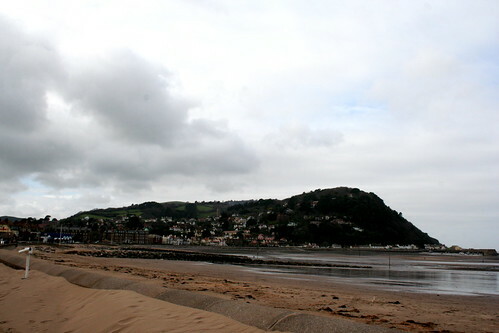 Minehead itself is on the shore facing Wales and, while we weren’t there at an exceptionally beautiful time of the year, I love a beach in winter, and the stark grays and tans were beautiful to me. The town itself was much nicer than I expected (I thought it would all be touristy, but it seems like there’s a good solid population there) and we were even able to find almond butter at a little natural foods coop called Toucan Whole Foods. Can I tell you about the vegan goodness there?! So many products I’ve always wanted to try from Sheese & potted mushroom pates & incredible looking locally made tofu…yum. Also, raw goats milk. For sale. In a store. America, I hate you sometimes. One of the places we ended up eating at a few times, though, was the grocery store–Morrisons. 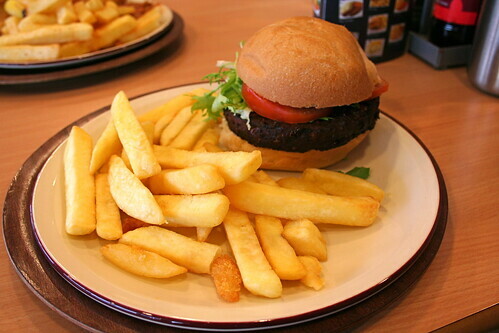 Yup, they have a little restaurant in each store with a pretty varied menu–fish and chips to breakfast to veggie burgers–and I have to admit, that veggie burger was delish. Full of vegetables and for under 3£, it couldn’t be beat. Food at the Butlins, the resort where the festival was held, was subpar at best (I won’t even tell you the horrors of the “veggie sausage” I ate there…I’m getting traumatized thinking about it) and we ate twice at Pizza Hut to stay alive, so I was thankful for Morrisons and it’s veggie burgers and egg bagels from heaven. 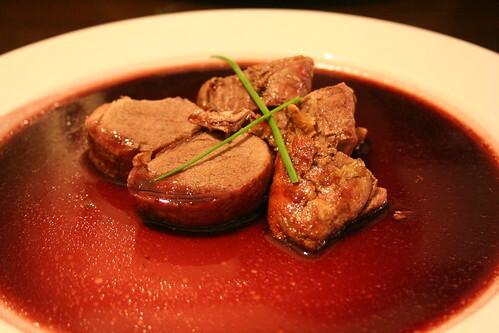 Don’t expect gourmet there, but plan on some bang for you buck. 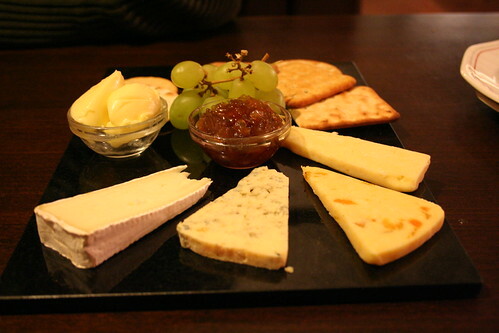 The other stand-out meal in Minehead was at Cafe Cream, a cafe/coffee shop. We wandered in there looking for a late lunch and was pleasantly surprised by the vibe and the food. I ordered the Nutty Blue & Bacon (Exmoor Blue Cheese, bacon, spinach, walnuts on ciabatta) and G ordered the Moroccan Chicken (Chicken, roasted vegetables w/ hummus & cous cous on gluten-free bread). 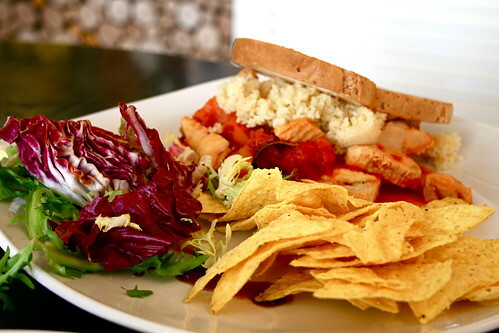 G’s was a little bit funky–cous cous on bread–but I can roll with that, especially considering how spicy and flavorful it was. 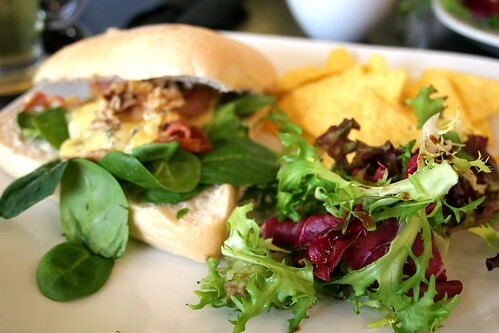 Mine was a comfortable sandwich full of pairings I adore–bleu cheese & bacon, walnuts & spinach–and you really can’t go wrong with it. A white, airy interior, the coffee shop felt like home to me, especially with more indie/alt music playing. 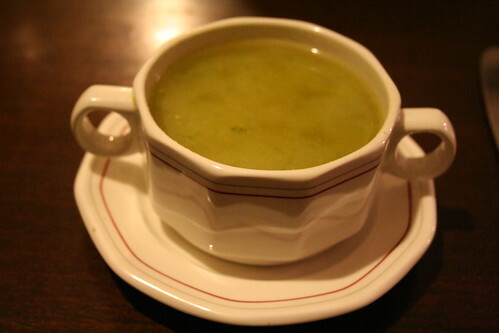 I also loved how full it was in the middle of the day and the range of folks in it–not just younger people, but also several elderly couples enjoying a midday tea. Another “must” if you’re ever in Minehead. I can’t say I would have ever gotten the chance to head down to Devon or to the coast if not for the festival, so I’m thankful for that & can’t wait to get back and tromp around some, spend more time in the little towns. The festival itself was a blast–Scratch Acid, Thurston Moore, Yann Tiersen, the Magnetic Fields, The Fall, Robyn Hitchcock, and, of course, seeing Jeff Mangum play Neutral Milk Hotel songs two more times–it was an exhausting and musically amazing weekend. Too many bands to name, too many good sets, and I think G has 4 GB of clips & photos. Needless to say, a lot to go through. 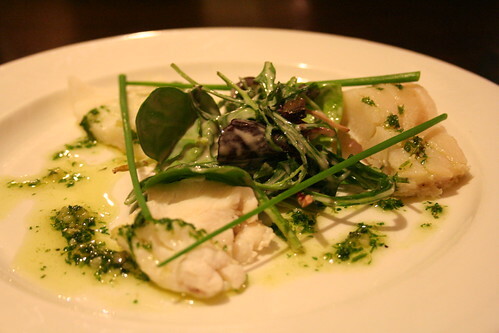 Up next, London & a super foodie day with Monica Shaw! 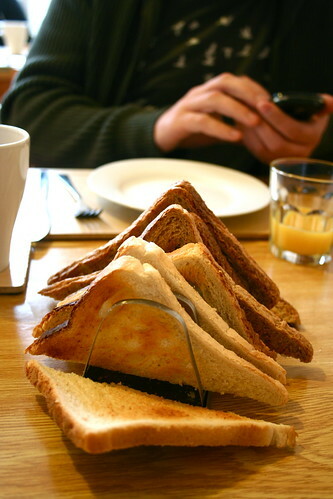 TOAST RACK!! It almost looks like one of those little desktop bill-filers. Get one of those and an expanding trivet and you’re all set. I’m jealous of your trip so far, and the obviously perfect grey beach. Have you ever been to MI in the winter? You totally get the same type of striations of different greys and browns and purples (even when it’s covered in snow). I haven’t had a truly exceptional meal in a restaurant in the past 4 years unless it was outside of the UK or was at one particular Italian restaurant which does superb Italian food (go figure). Your experience is all too familiar. A toddler on a transatlantic flight is kind of ridiculous anyways. That toast stand is legit, it would keep freshly toasted bread from getting soggy on your plate, genius! I got it cut & styled the day we flew out of the States–totally recommend getting hair straightened before travel, it stays in place until it’s washed (which is a must for someone with curly hair like me…gets all messy and gross after it’s been “slept” on in a plane)!